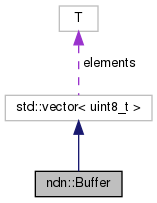 In most respect, the Buffer class is equivalent to a std::vector<uint8_t>, and it in fact uses the latter as a base class. In addition to that, it provides the get<T>() helper method that automatically casts the returned pointer to the requested type. Definition at line 40 of file buffer.hpp. Creates a Buffer with pre-allocated size. Definition at line 69 of file buffer.hpp. Creates a Buffer by copying contents from a raw buffer. 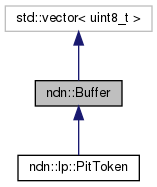 Definition at line 78 of file buffer.hpp. Definition at line 89 of file buffer.hpp. Definition at line 98 of file buffer.hpp. Definition at line 107 of file buffer.hpp.